No fewer than seven undefeated fighters will step into the ring on Friday, November 18, at Fantasy Springs Casino Resort in Indio, California, as Golden Boy Promotions showcases its growing list of prospects on the undercard of the highly anticipated 10-round welterweights showdown between former World Champions Mauricio “El Maestro” Herrera (22-6, 7 KOs) and Pablo Cesar “El Demoledor” Cano (29-5-1, 21 KOs). And Hollywood will come to the desert as former three-division world champion Vinny Paz – the subject of the new critically-acclaimed film “Bleed for This” starring Miles Teller and Aaron Eckhart — will be the special VIP guest. The five-time world champion will be available to meet and greet fans in attendance at the Special Events Center before the televised portion of the Estrella TV Boxeo Estelar broadcast. From top to bottom, the November 18 show will give fans a glimpse of the future of boxing. In the co-main event, KeAndre Gibson (15-0-1, 7 KOs)of Las Vegas will take on the rugged Mahroni “Ruso Jr.” Montes (31-5-1, 21 KOs) of Los Mochis, Mexico’s in an eight-round welterweight fight. A battle of unbeaten fighters will open up Estrella TV’s Boxeo Estelar, as Morgan “Big Chief” Fitch (17-0-1, 8 KOs) of Pittsburgh, PA will fight Issah Samir (14-0, 12 KOs)of Accra, Ghana in a six-round middleweight showdown. In a six-round lightweight affair, rising prospect Oscar Duarte (8-0-1, 4 KOs)from Parral, Mexico battles fellow countryman Rony Alvarado (9-8, 5 KOs) of Juraez. Red-hot prospect Cesar Diaz (2-0, 2 KOs) of Lancaster, California will appear in a four-round super bantamweight fight against Tabasco, Mexico’s Jose Naranjo (3-4-1, 1 KO). Also on the card, highly touted Golden Boy prospect Joshua “The Professor” Franco (7-0, 4 KOs) of San Antonio, Texas will face Felipe Rivas (19-16-4, 12 KOs) in a six round battle of bantamweights. Opening up the card, LA’s Marvin Cabrera (1-0, 1 KO) will be taking on Cancun, Mexico’s Israel Villela (5-3, 2 KOs) in a six-round super welterweight match up. Tough Italian-American, Rhode Island fighter, Vinny Paz (50-10, 30 KOs) is a former five-time world champion having held titles in the lightweight, light middleweight and super middleweight divisions-as well as becoming the second fighter in boxing history to win both lightweight and junior middleweight world championships. Shortly after winning his junior middleweight world title, tragedy struck as Pazienza was forced to relinquish the title due to a serious car accident in which his neck was broken. Doctors informed him he might never walk again-let alone fight again. Determined to gain another world title shot and disobeying doctor’s orders, Paz maintained his workout regime and returned to the ring thirteen months later defeating future WBC World Jr. Middleweight Champion Luis Santana via a 10-round decision. Pazienza also went on to overthrow Roberto Duran twice for the IBC Super Middleweight titles. 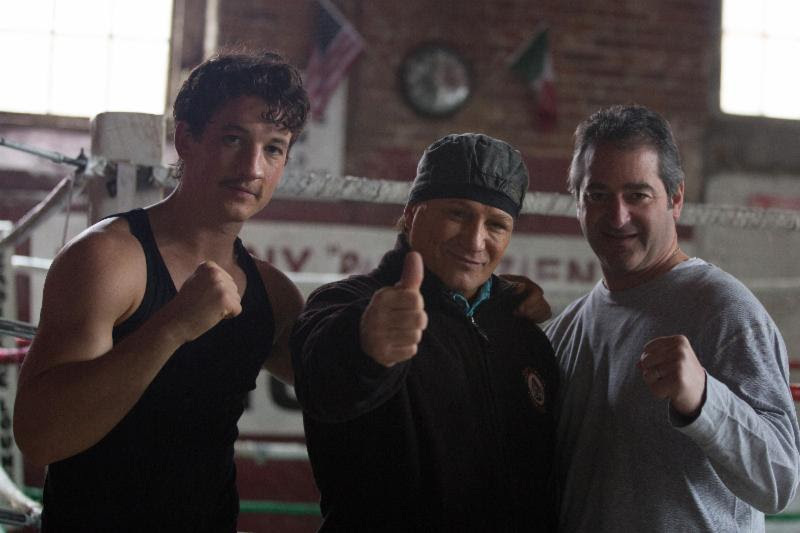 The 2016 film Bleed for This, starring Miles Teller and Aaron Eckhart is based on his injury and comeback to boxing.